We spent 4 days visiting various sites of the French capital. We began with a guided tour of the Stade de France, followed by a trip up the Montparnasse tower to enjoy the stunning views from the rooftop. 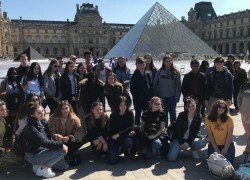 On the second day we had a very busy day which began with an early start to beat the queues at the Louvre. Miss Glynn was able to impart lots of knowledge about the different time-periods and styles of art we were seeing. Pupils were mainly shocked at the meagre size of the Mona Lisa in a huge private room of the gallery! We then had a lovely time in the Tuileries Gardens and thankfully it was perfect picnic weather. After a spot of lunch we continued on to the Chateau of Versailles where we learnt about the lives of French royalty. On returning to the centre of Paris there was lots of oo-ing and ahh-ing at the sheer size of the Eiffel Tower and we just had enough time to take some pictures to try and capture how impressive it was before our boat cruise down the Seine, passing many more Parisian sights like the Musée D’Orsay and Notre Dame. Day 3 was spent in the Disney parks and pupils had plenty of opportunity to practise their French with all the purchases they made. One pupil coming back feeling very proud that she had been mistaken for a French person! On the final day we headed to the street-art area of Montmartre and climbed the 270+ steps to the Sacre-Coeur. On the way back to the coach we passed by the Moulin Rouge and then continued on towards Calais for the journey home. Just before getting the ferry we had a stop at a chocolate factory where we learnt all about chocolate, how it’s made and pupils (+ Miss Glynn) had a go at decorating their own chocolate bar. This was a fantastic end to what was a jam-packed whistle-stop tour of Paris! The group all behaved impeccably and were a pleasure to take away!